my krittercam is dead! don't know what happened between friday night and monday morning, but i got to work today and noticed it wasn't showing anything but a black screen. after about 10 different attempts at plugging the usb device in various configurations, i called it quits and put up a big homemade sign on my webcam page alerting prospective stalkers not to worry but my webcam service would be temporarily unavailable for the day. now i just tried hooking it up to my computer at home and it doesn't work either, so that's my final confirmation that the krittercam is indeed dead. don't be alarmed though, i have a discontinued kensington vga videocam that i have at home but never use (watching me work is one thing, but watching me at home in my bedroom at 4am in the morning is something else), so i'm going to bring that into active duty and see how that plays out. however, i think i'm going to buy another webcam - i never got the chance to do my simultaneous broadcast experiment. for lunch i went down to koreana (on prospect street in cambridge) for a fact facting mission, a lunchtime reconnaissance job. i knew they had lunch specials (i'm no stranger to koreana, i've eaten there since they first opened), i wanted to go down for myself and try it out before inviting others to come join me. my original idea was to walk from the office to koreana, but after checking an online map i realized it was a mile away and by the time i walked down there it'd already be time for me to walk on back. but turns out the place is very close to central square, so i hopped onto the train and took it one stop over from kendall, then i proceded to walk the couple of blocks to the restaurant. when i got there, close to 1pm, it wasn't crowded at all (yet at the same time it wasn't empty, there was at least 5 occupied tables). the ambience was laid back, clean, and tables were in booths just big enough to seat 4 people. i was happy to see on their lunch menu that they indeed had korean box lunch specials, and cheaper than suishiya by $1-2 (cheap, and closer to the office as well). i ordered the bulgogi special with extra sushi, i wanted to sample one of their biggest menu item so i could see the whole spectrum of what they had to offer. 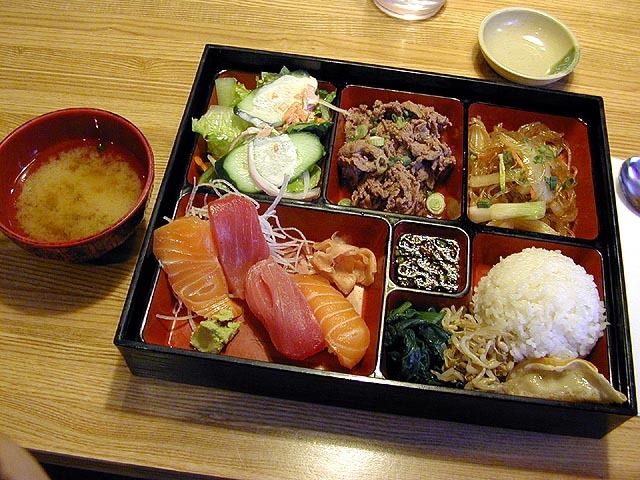 the service was fast, and when the waitress brought my box lunch while i was still daydreaming with my hot bowl of miso soup, my eyes almost fell out. the box was enormous, much bigger than suishiya and with more variety. they only thing they didn't have was tempura nor do they serve the rice in a metal bowl, but they more than made up for it in other foods: thick rice noodle salad with scallions and onions, spinach and sprouts kimchee (kimchee lite, not the strong stuff), a regular salad with a mild dressing (i actually prefer the suishiya dressing a little bit more), and no skimping on the sushi, thick slices of raw fish that just melt in your mouth beause they're so tender served on rice balls and slices of radish. i even got a little dish to mix up my wasabi with the soy sauce, and did i mention ginger slices? the bulgogi main course was pretty good, although i would've preferred it to be more on the spicy side (i'll ask for spicy next time, i'm sure they won't have any problems making it hot in a korean restaurant - you got to have spicy food on a cold day!). all this for a little bit over $9 (the other box lunch specials on the menu are cheaper - remember, i went the distance with the deluxe edition, which if you want to compare, is actually cheaper than the little lunch boxes at suishiya). when i went to pay i accidently pulled out a $5 thinking it was $20, so there was a little bit of confusion before that got straightened out. i left very well fed, completely satiated, excited to go back to the office and let people know how great koreana is and worth going the next time there's an outing! i haven't even begun to mention the korean bbq they have there! all day long it's been drizzling, the weather not cold enough to sustain what's suppose to be beautiful snow instead of chilly rain. when the sun went down on this overcasted day, the precipitation had a change to develop into real snow, although the ground still wasn't cold or dry enough to make the snow stick very much. nevertheless, i went home happy, still in a state of epicurean euphoria over what a great lunch i had, my face and hands were freezing but i didn't mind it at all. the rain-sleet-snow gives a normally boring kendall square some gritty urban character i think. the steam columns rising out of underground vents, everything glistening in shiny slickness, people in a rush to get out of the nasty weather to a place of shelter - all this makes me happy in my own little way. just for old times sake i walked to the t via an alternative route that allows me to see a glimpse of the boston skyline off in the distance over the longfellow bridge and charles river. i miss working in the city, but i love my shorter commute home and i don't miss the city during rush hour when the streets and the stations are thickly coagulated with commuters. busride home i bumped into freelancer sam. he was out of the office today, the official reason being sickness. it took us a while to make the connection that we knew each other. he finally broke the "is he or isn't he?" awkwardness by making the first move and registering with hand gestures and sounds that he recognized me. i immediately started to question the validity of his sickness. "i thought you were suppose to be sick today? how come you're out?" went my interrogation. "i am sick, i just got back from the doctor," he replied. the stuffed up way he spoke was proof enough that he really was sick. sam and i live just mere blocks away from each other, so we got off at the same bus stop. he introduced me to his girlfriend, who was also sick. they both came back from grocery shopping at the mt.auburn super star market. we parted ways at a dangerous snowy intersection. i walked home making fresh tracks in the thin layer of snow that had started accumulating on the sidewalks. after dinner (a self made affair, noodles with a custom blend of soy sauce, coriander, peppers, and a heavy dose of chopped garlic which i'm still tasting in my stomach as we speak), i spent the next 3 hours installing os v10.1.2 on my ibook so i could run the new iphoto program that apple introduced today at the mwsf along with the pivoting lcd screen imacs and the 14" screen ibooks. that new imac is snazzy. wonder if they'll have them (floor models are fine, i just want to see it) at the apple store in the galleria mall? definitely worth a visit if they do. anyway, i finally got iphoto installed on my ibook (too many iproducts! ), and it's kind of a cute program but i still prefer iview multimedia pro for my digital photo cataloging needs. so i was really happy to find out that iview had already been carbonized, it didn't have to go through the os 9 emulator in order to run it.